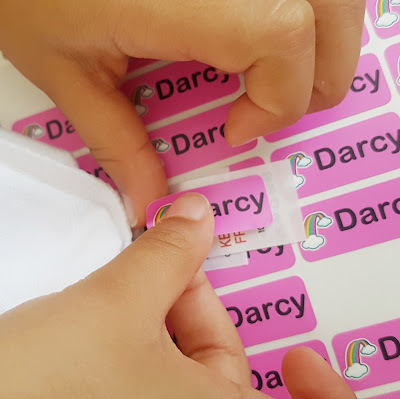 So let me tell you more about My Nametags, they offer a range of products; coloured stickers, coloured iron-ons, black and white iron-on and black and white stickers. The website is so easy to use. In the Text section you can write the name you would like. The design section is where you can choose a little picture to go onto the sticker, after that you select a background of your choice and then proceed to the checkout. You can personalised your labels with up to 3 of texts. Which means as well as your child full name you could include a telephone number. I allowed Darcy to pick the colour and rainbow. She loved being involved in the design process. The labels come in a handy storage envelope, which is perfect for tucking them away safely till you need them again. One sheet contains 56 name labels which is more than enough. They peel off as easily as stickers and you just place them straight on to the item. No ironing, no sewing, no writing, just quick and easy. 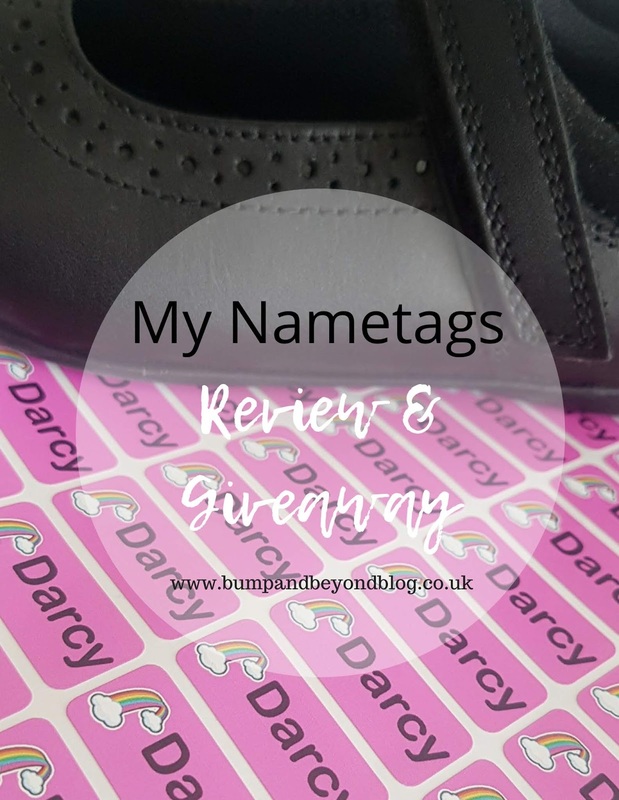 My Name Tags stickers cost £11.95 plus £1 postage for a sheet of 56 stickers. I think they are really good value and I will be ordering more in the future for when I have to replace Darcy's uniform. Enter below to be in with the chance of winning a sheet of 56 Name stickers. 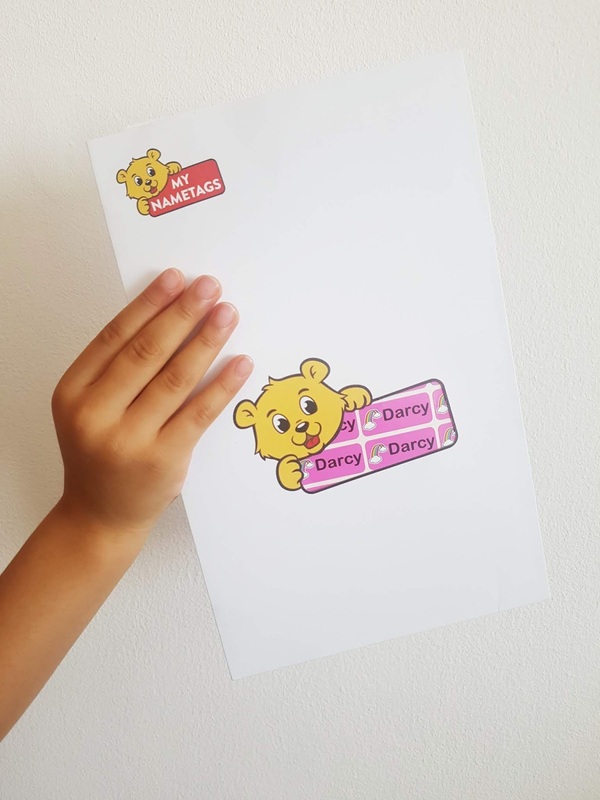 How would you design your My Nametags labels? Ooohhh, spoilt for choice. My daughter recently told me her favourite colour was now pink after being purple for ages. I asked why she likes pink now and she answered "because it's nearly purple". I love the butterfly design. We've used these before, so I'd be tempted to use the same design. However, I'd let my daughter decide. We do use her surname (partly in case I need to label something for work), and that has gone over well. I love the mermaid design. I like the look of the butterfly design. The Fire engines would be very popular with my son! Loves them. I like the butterfly ones, my daughter loves butterflys. Its got to be the dinosaur ! I would just let my son decide, I imagine he would choose the dinosaurs. Probably the blue with the pirate flag on - but i'd let him choose! Dinosaurs for my son as he loves them! football ones with my son's name would be cool! My son would love some football ones for all of his belongings!